Happy Gilmore, Gillmore, The Price is Right, Adam Sandler, movie, soundtrack, characters, review. One man wants to be a professional Hockey player more than anything. He can fight well enough to be a Hockey player, but he just can't skate. Eventually he is kicked off the local team he was on. His life appears without purpose until he discovers a new skill.. He can hit a golf ball further than almost anyone. At first he sees Golf as a sport of old men with bad pants. But when prize money enters into the equation he decides to try his hand at golf. He uses the name Happy Gilmore and wins his first amateur tournament, even though he can't putt up close worth a damn. His friend Chubbs a man who lost one arm to an aligator continues to teach him the finer points of putting. Happy Gilmore plays golf more and more. He becomes famous for his antics. He throws his club when angry, swears, and even talks to the golf ball. At first sponsors of golf are outraged but when ratings begin to climb and a new younger demographic begins to watch golf everyone appears happy.Happy decides he needs a caddie so he picks a homeless guy off the street and just uses him. Finally the big tournament of the pro's approches. Happy Gilmore must beat champion Shooter McGavin to win the prize money and save his grandmothers house from foreclosure. Things are looking good until a deranged man, hired by McGavin hits Happy Gilmore with a car. Amazingly he gets up to play, but his long shot has suffered. Finally its all down to one shot for Gilmore. But then a gigantic metal structure falls on the middle of the field and Gilmore is told he has to play the shot. He bounces the ball off metal pipes and down slopes until it finally makes the hole in a most miraculous shot. 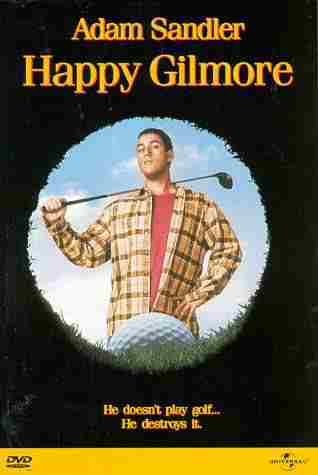 Happy Gilmore is the only movie about Golf that makes it appear fun. Everyone wants a colorful golf player, the prim and proper sorts who never say anything are exactly what this movie is not about. This is Adam Sandler's best movie. He fights with Bob Barker, goes diving for balls under water, and manages catch phrases that one will never truly forget.